Scott Turner is also a non white Republican who won his election in the newly created 33rd District. As I read the figure, the math looks right, he has the ten Urban Anglo Democrats and then a single Rural Anglo Democrat, for a total of 11 Anglo Democrats. The problem I think is that the labels for the bar graphs are rather confusing and make the figure open to multiple interpretations. My interpretation (which could very well be mistaken) is that for all categories but Women, the rows are mutually exclusive. The entries should thus read Urban White Democrats, Rural White Democrats, Hispanic Democrats, African American Democrats, Republicans, Dem + Rep Women (or something like that). If I add up the first four categories, I get 66 Democrats. 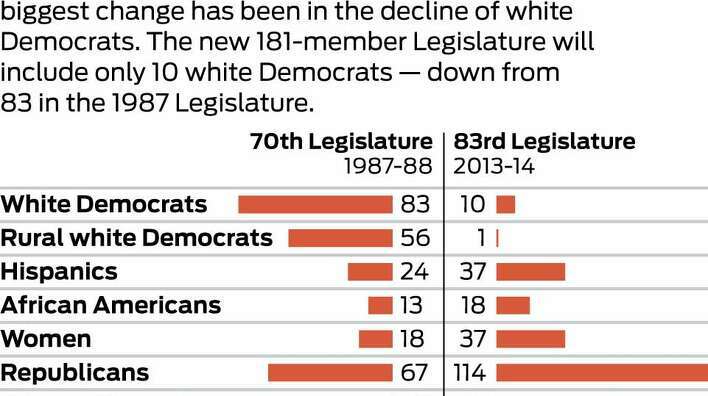 The numbers for Democratic Anglos and Hispanics (assuming Gallegos is included among the 37) look correct, but by my count there will only be 17 African American Democrats. That leaves two Democrats “missing”, who would fall under the Asian American Democrat category (which was not included in the figure). MPJ – You may be right, but I interpreted the chart as “all white Ds” and “rural white Ds”, i.e., a subset. The story does specifically say “there will be only 10 when the new legislative session starts”, which is why I objected to the math. I also think “African-Americans”, “Hispanics”, and “Women” may refer to both parties, in which case they undercounted African-Americans as well – I find 16 A-A Dems and three A-A Rs. I haven’t tried to tot up the others. Who knows? I missed that in the text on the ten. It could be that one person created the figure and one wrote the article, with the latter reading the figure as you did and the creator of the figure intending it as I read it (with the problems with the labels the underlying source of the confusion). If African Americans and Hispanics refer to all legislators, then they also under counted Hispanics (40 total), 30 D-Reps, 7-D-Sens (including Gallegos) and 3 R-Reps.